Tirrases is a urban community located in the metropolitan area of San José, the capital city of Costa Rica. The community has18 thousand inhabitants, of which the 45% are under 20 years of age. Around a 7% of the population does not have a basic literacy level, and it is estimated that only the 8% of the population has college studies (Estado de la Nación: 2002). The district suffers of high social inequalities and high levels of social exclusion increased by a dropout rate of 33% among children and youth. Domestic violence and drug traffic are other problems affecting the social development of the community. Our counterpart for the project´s development is the Community Development Association, that works from different areas to improve the living conditions of the community members. We proposed to work with a small group of 10-15 housewives, in a process divided in two phases: the first one will aim to develop basic technological skills among the participants, and the second one seeks to create a community digital story supported by the use of ICTs. What did we do here? We designed a process more focused in the use of ICTs. 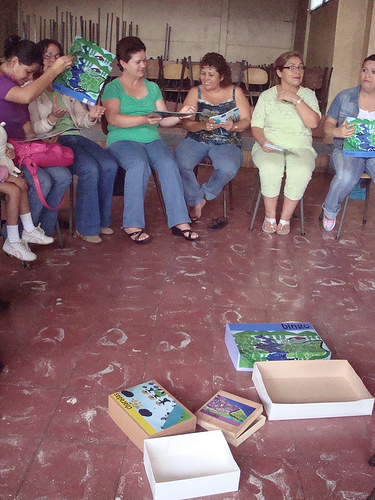 The Association helped us to gather 10 ladies together, and we had 4 meetings with them. We planned to focuse on the use of digital photography and web 2.0 tools, and for the first 2 workshops, everyone came with lots of interest and many expectations. However, we had a break for christmas and when we tried to start the workshops again the ladies did not come to the meetings. We called three different workshops during the first month of 2010, using the same strategy as in december: a representative of the association called them one by one and for the three times everyone confirmed but nobody showed up. We decided to make a last interest call through the association, and according to them the ladies said they “are busy with other things”, “do not have time for the workshops because they have to take care of their children and grandchildren” and “do not have more interest in the project”. According to our contact person in the community, this kind of situation is normal in the community. She even said to us “if we go now house by house to check out what the ladies are doing, they will probably be watching tv. Is not that they do not have time: is that they do not have interest”. For us this was a very sad situation, because the team raised very important issues of the community that they wanted to explore. They identified the lost of public spaces as one of the biggest problems within Tirrases and wanted to base the project in the rescue of them. With the support of Asociación Asofenix, a collective project working with sustainable energies in the region of Boaco, we gather 14 girls from 12 to 31 years old in San José de los Remates, a small hometown that has a telecentre inside the municipal library. 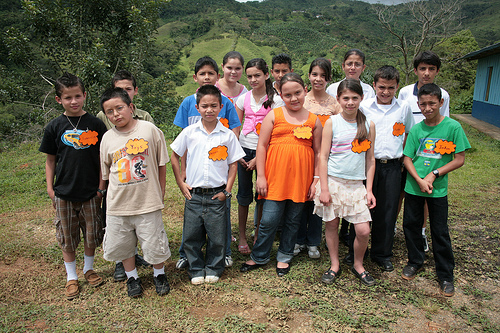 The girls come from 6 different communities (“comarcas”) of the Boaco region. This six communities have been benefited by Asofenix projects, and now have electricity or drinking water thanks to Jaime and his team (that counts on the work of volunteers from different countries of the world). What are we doing here? We are exploring with the girls on how they can become intermediaries between their communities and the rest of the world. They are developing capacities in the use of web 2.0 tools, specially e-mail, blogs and photo albums, as well as disconnected tools such as anthropological observation, interview and local knowledge rescue. We want to see how it works when a group of community journalists can work as intermediaries between the information and knowledge produced within their communities (to the outside) and the information and knowledge (to the inside) available in different spaces of the internet that can be useful to their communities. With the team we are getting close to computers for the first time, so it has been a slow process.